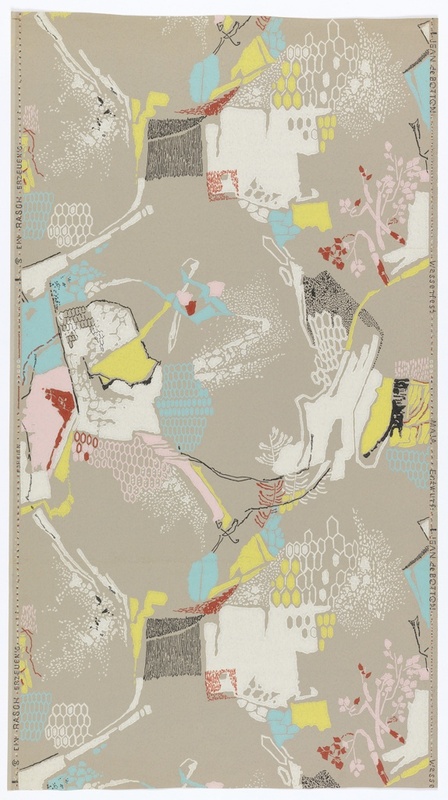 Maja is a mid-century paper produced by a German manufacturer, designed by an American artist born in Greece but active in France and the USA. This is one of three papers in the museum collection by Jean de Botton, and while all his wallpaper designs are rather abstract this is the only one with no clearly discernable motifs. The design has a collaged look with the layering of the different textural areas which include dots, lines, honeycomb patterns, and splashes of bright color. Each of the different masses of pattern are linked to the adjacent groups forming a cohesive design. De Botton’s wallpaper designs are not unlike his paintings. His still life designs are rendered in a rather abstract manner and all contain a certain layering or buildup of materials, with many of the elements not recognizable. De Botton was a painter, illustrator and muralist known for his genre, abstract and surrealist paintings. He studied at the École des Beaux Arts in Paris, and exhibited at numerous Salon’s during the 1920s, receiving awards for his paintings. From 1934-1938 he participated in the Carnegie Institute’s International exhibitions, a yearly show meant to educate and inspire audiences, and to build a collection through the purchase of the “Old Masters of tomorrow” who would be featured in the exhibitions. Following the International exhibitions, he was featured in numerous solo exhibitions across the United States.